Distributor and wholesaler is welcome! 1. Electronic Industries: Thermostats and electronic Guidance Systems, PCB &Â Assembled PCB Cleaner, PCBs Relays, Capacitors, and Semiconductors. Micro-Switches, Meters, Ceramic parts, Connectors, Switch Gears, CD, DVD, Aviation aids and Print Heads, ,Â etc. 2. Medical &Â Pharma Industries: Instrument Used for Surgical, Dental &Â Endoscopy, Pathologies Glass instruments, Dental Mouth Mirrors, civets, prostheses, Breathing Apparatus, Masks and Valves, Laboratory instruments, Glassware like Slides Test Tubes, Sieves, etc. 3. Optical Industries: Spectacles, Lenses, Prisms, Mirrors, Frames, Microscopes, Cameras, Telescopes, and Fiber Optics. Etc. 4. Automobile Industries: Carburetors, Fuel Injection Systems, Bearings, Pistons, Engine Blocks, Valve Bodies, Brakes, Components for transmissions &Â steering parts, etc. 5. Hotel Industries: Ceramic &Â steel Dishes, Glass ware-Whisky &Â Beer Glass, Decorative serving dishes, Cutlery, Fruits, Vegetables &Â Meat etc. 6. 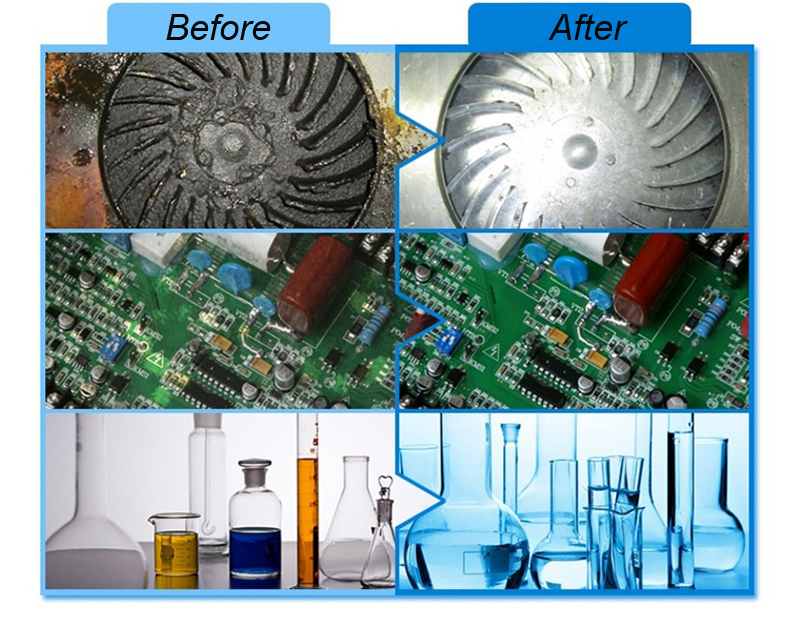 Plating Industries: Cleaning of all items like Gold, Silver, Nickel, Chrome &Â copper before and after plating. 7. Watch &Â Jewelry Industries: Watch straps, Watch cases, Watch parts, Ornaments, Precious and semi precious stones, Medals, Coins, etc. 8. Other Applications: Wire drawing Dies, Tools, Moulds, Measuring instruments, Gear mechanisms, Pumps, Chains, Scissors, Polymer Filter, Fire Extinguishers, Drawing pens, Micro tips, Fossils, Geological &Â Archaeological specimens, Musical Instruments, Typewriter Components, Wires &Â Dies, painting brushes, pedicure, Mini cure etc. Etc. 1. Stainless steel tank SUS304 has resistance to wear and long work life. About the Graphite Paper production and Graphite Paper Production Line, we have more than 20 years experience in this field. We are the promoter of graphite paper production line of domestic. And we also the leading enterprise in the field of graphite paper production line manufacturing of domestic. There are more than twenty companies of domestic are use the Graphite Sheet Production Line that produced by our company. We also exported our machines toSouth Korea,RussiaandIndiaand we are praised by our customers due to excellent energy-saving and environmental performance. Our company has three national patents in the field of manufacturing graphite paper production line. (1) Graphite paper production equipment patent, No. : 3315003. (2) Expansion furnace for manufacturing of graphite paper patent, Number: 3315867. (3) Extension and precision press machine for manufacturing of graphite paper, Number: 3315069. There are four forms of graphite expansion furnace which we produced, diesel, natural gas, liquefied gas and electric, users can choose the most suitable according to the actual situation. The graphite sheet production line that manufactured by our company has very significant energy-saving effect. It is controlled by computer, the motor frequency is can be adjusted and automatic operation. About the total installed capacity, it`s almost above of 30 kW that produced by other manufacturers, but which we produced is only 12 kilowatts. Also the graphite sheet production line equipment we produced is with dust discharge function and it is unmatched by other manufacturers products. Now environmental protection and energy-saving attaches great importance, the emissions of production equipment is more and more strict all over the country, we are required to do technical transformation for existing production equipment of a lot of companies for environmental protection and energy saving reasons by now.